Graduates of St. Patrick’s College, here in Thurles, Co Tipperary will receive teaching degrees from the University of Limerick, with effect from 2012. Today the Third Level education college announced an academic alliance with the University of Limerick (UL), marking an historic occasion for this Thurles College. 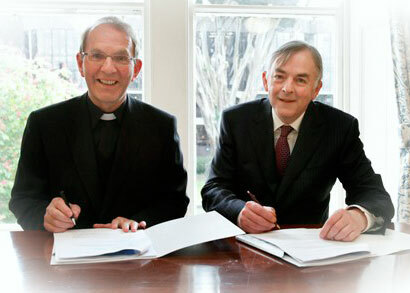 With effect from September 2011, teacher degree programmes at St. Patrick’s College will be accredited by the University of Limerick and from 2012 graduates of the College will be awarded University of Limerick degrees. St Patrick’s Teacher Education College here in Thurles is located in the former Seminary, also known as St Patrick’s, which was established in 1837. The foundation stone of the Seminary was laid in the presence of Daniel O’Connell and the Synod of Thurles was held there in 1850. The College opened as an educational institution first in September 1837, offering Second Level education in the humanities, with limited contribution to the sciences, for students wishing to prepare for the priesthood as well as careers in business and other professions. In 1842 a philosophy department was added and by the middle of the 1860’s the College had developed into a major seminary, with the addition of a full theological faculty. Described in 1850 during the Synod of Thurles as a “noble pile ” the College witnessed much debate amongst the catholic clergy, the outcome of which significantly influenced the evolution of primary, secondary and university education throughout Ireland. A total of 220 students currently now study at the College. St. Patrick’s College was first established as a third level College of Education in 2004 and currently offers two concurrent teacher education programmes. All graduates of the College are registered with the Teaching Council and qualified to teach Business, Accounting, Religious Studies and Irish to honours Leaving Certificate level students. Last year a Governing Board was appointed to St. Patrick’s College with responsibility for strategic development. Board members now include; Chairperson Robbie Kelleher (Head of Global Investment Strategy at Davy Stockbrokers), Dr. Bernadette Flanagan (Director of Research at All Hallows College), Dr. Finbarr Bradley, (former professor at DCU, UCD and NUIM), Dr. Richard Thorn (Director of Flexible Learning, IOTI) and Tipperary born John Lonergan (former Governor of Mountjoy Prison). The College welcomes enquiries from prospective applicants and will endeavour to facilitate applicants, who may wish to visit the College. For further information regarding programmes at St. Patrick’s College visit HERE.